-In Maine, who designed the hull is a very big deal. I haven't heard much talk about differences in hull designs out west. Do the welders crate their own designs? -Some boats have longitudinal stringers on the exterior of the hull. Some don't. For a recreational boat, are these a good idea? 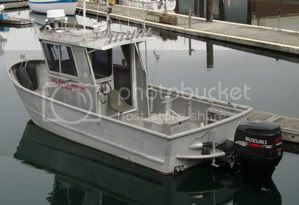 -Maintenance on an aluminum hull in salt water? Just replace zincs? Some seem to be powder coated. Good idea or no? -Sweating on the inside? Foam insulation to make things more comfortable in cold weather? -Noise has been a pretty large problem on the few aluminum hulls I've fished from. Foam again? The noise comes from the bow wash and just us walking and working on the aluminum decks. -You boys like to move a lot faster than I'm accustomed to. At very low speeds, like 5 or 6 knots, do you still have decent steerage with the two outboards? -In Prince William Sound, is there ever enough sun to justify installing a solar panel or two to charge house batteries? Reading through this list, I'm embarrassed to be such a rookie asking such questions. I thank you for any guidance you can supply. 1. With wood and fiber glass the designs are infinite, with aluminum you have to take what the metal will give you because it is so difficult to form. One of our forum members recently had a boat designed by C Raymond Hunt, variable deadrise type which was a challenge for the builder as I understand it. 4. Foam below decks is to be avoided as it leads to water entrapment and corrosion. 1) Most welded Alu hulls are a constant deadrise design, some are variable deadrise, all depends on the NA. Variable deadrise will have a better ride although you usually lose some hull volume forward. 2) Their main function is to serve as rub rails, not all hulls have them, such as mine. 3) Chaps is the man for proper anti-fouling coating info - heed his advice. 4, 5) Injected foam flotation is a big no, no. Foam blocks put inside the hull, properly attached work fine, I believe this is required in Canadian built boats. it - if I build another I will. 8) Even on cloudy days the panels provide some charging, often more than you might think. Go to the Forum and find "28 Crozier / Hunt - New Build" - you can see my boat which has a variable deadrise hull. it's about the same because you still have to "twist" the plate to make the bow as you go forward. since you start twisting the plate earlier where as a constant hull is a flat plate until you get close to the bow then it gets a big "twist". I'll take a shot at item #1 in Chaps' reply and notes from Jon too. #1. The shape of the bottom of planing boats is generally a constant V or deadrise angle or is warped, varied, changing deadrise angle from the keel to the chine intersection: I agree that is generally the case. However, saying one ride is better than the other is a bit of a wide of scope. For example, IF the term ride means; to have a lower impact in a steep head sea (say 4' swells) at 30 to 40 knots? THEN there are many designs where the constant deadrise will offer a sharper leading edge waterline (plan view) which results in a gentler entry (impact) of the bottom. The word gentler is relative to a pounding or sudden impact. On the other hand, IF the word ride means a sweet and livable motion in a COMBINation of sea states-, head seas at speed or slow ahead, following seas with stable helm and various other conditions all COMBINED.... to define or imply the term 'good ride'; then there are many instances where the warped/variable/changing deadrise bottom performs the COMBINAtion of conditions with more ease than the constant deadrise V bottom. The remark about twist of the bottom panels is another too wide generalization... For example is the boat has a 20 t0 25 degree deadrise at the transom and is Truly constant deadrise then there is almost no twist all the way to the chine intersection. However, if the boat has the previous transom deadrise and begins a transition at 60-70% forward (of the Load Waterline) into a sharper V??? well that isn't really a classic constant deadrise- but is actually a subtle warped bottom ! The idea that pulling up sheet/plate to form the bottom is (overly) time consuming is kind of misstated, I've built a few and that's only a fraction of the hours of work forming a hull. So the remarks about this or that design taking more or less time to 'pull' the various bottoms' into their final configuration seems overly stressed to me? Sure there is some time, but even one man and a few tools can plank a 40'er in a day (forward 1/2 the hull & chine down) so I'm not clear on the significance? If you decide to go constant V- OK fine. If you decide to go variable V- OK fine. I can't value the time to form either shape as a factor in the decision: I'd stress the performance and seakeeping in the decision not the shop floor time? Maybe I missed something in regard this aspect of the two main bottom forms? but the labor to form either is a wash in my opinion. More effect on net time to build is the framing as regards the contribution to plating. The same shape of hull - planked on frames will usually take 2x to 4x the labor to deliver the same shape as a plate first design. #2 Longs outside the hull. As the others mentioned these various cross section longitudinals perform various tasks in the hull. Their location outside the hull versus inside results in other savings of effort. Many of these boats regularly tie up to sheet pile docks- something not commonly done with plastic or cellulose boats as they are so fragile if slammed to a steel sheet pile dock face. So the longs can act as rub rails at more than one location vertically from chine to sheer. Their location is also related to sheet stiffening. Aluminum topsides may be as thin as 0.160" or 5/32" so framing is required to keep the panels rigid. Adding a bar or angle inside the hull requires notching the bulkheads or vertical frame members- and the same strength can often be acquired by simply putting a three sided extrusion outside! The longitudinal works the same as if it were notched into frames- it adds a length wise stiffener element to break up the sheets' panel size. #4 be added with a complimentary curve to the sheer thereby contribute to the lines of the hull as displayed. #8 depending on the interior framing details; this external extrusion can also be located over 'struts' inside the skiff that hold the gunwale guard deck to the topsides to minimize or eliminate weld 'print through' and improve cosmetic appearance. So these external longitudinals do have uses not easily realized in other materials. more pennies for your thoughts about what you'd want in a welded aluminum boat. I'll note #7 too. With thrust outboard of the keel plane the turning moment arm is greater than on centerline- add to this fact the ability to go forward on one and reverse on the other engine and outboard steerage can be described as in its own class compared to a single screw inboard rudder arrangement. Also automatically docking is now available in some twin outboard engine configurations! little or no lines handling to dock - even landing abeam in a breeze? I'd have to say that low speed steerage with pairs of outboards is far and away the most advanced steering controls afloat? The reason there are so many large horse power pairs featured (at least ) on Alaskan fishing boats is the geographic size of the fisheries. The coast line is longer than the contiguous states' by a large factor. Not all fishing is located just outside the few harbors- so having to run long distances to and from most fishing grounds leads to lots of down time- for a guide or even a sports and recreation user. Getting there and back - no fishing going on while running - means higher horse power to reduce the run out and back from harbors to fishing grounds. Not everyone has an extra day or two to run to a fishery. Guides make day trips instead of 3 day trips that would be required in a 5-6 knot boat by traveling 5-6 times that rate- allowing a fresh crew of paying clients to join them on the next day. So one feature of larger horse power engines is the 3X-maybe 4X increase in client fishing time- or guide paying time! Not all profit of course, as there is a huge fuel increase that does eat into the increased revenues- not to mention the increased cost of larger engines to amortize. just a few more thoughts in reply to the various questions. your first question about designers is valid so I'll try to reflect on the circumstance in the PNW. The relative time of market acceptance of recreational use welded aluminum planing boats in the >20some' to < 40' range LOA, means that designers haven't had the two to five generations to become well known as is the case on the East Coast. There are half dozen builders (at least) who build to their own lines, and more who use lines from designers, naval architects and other professional design firms. As a result, we find one builder who no longer builds has 'his' name attached to a series of boats he built 30 years ago- that were designed by someone still designing today. AND on the other hand we have designers' names associated with several different builders who currently offer boats in the PNW new boat market. If you combine all these different relationships- designers and builders (?) I'd say the market is somewhat different than what I understand to be happening on the East Coast? For example; most buyers here, look at different builders' boats at boat shows or harbors and decide which builders' boats are most desirable? Where- on the East Coast, as I understand from reading- a buyer might approach Builder One to build a one-off from Designer Ten. Any yard might be approached for this build- here in the PNW it is more common for a yard to build with one designers' work- allowing the yard to specialize and accumulate knowledge and skills applicable to that design's build. I'd hoped to address the designer versus builder differences between what (I may understand but probably don't!) is common practice in each marketplace. I would say there are number of one-off builders, in the PNW, who will quote a build from any designers' boat but they may not be able to offer a dollar for dollar competitive bid to a builder who's doing his 10th 28'er by Designer Ten? Hourly labor is most often higher for metal work than wood or plastic. The regional differences in wage for metal working skills is also higher in the PNW so many buyers are simply shopping price- not designer. Those buyers won't care who the designer of a production boat, they can afford, may be? hope these notes help contribute to your exploration of the PNW welded aluminum boat markets' various aspects in your original post? Wow, you guys, thank you! I came to the right place. These responses make a great deal of sense and will help immensely with my process. I've been emailing with a couple of aluminum boat building companies this week. Unfortunately, neither is willing to sell a bare hull-- one where I would finish off the interior myself. I understand their reasoning, but it might mean that, due to my limited finances, I need to buy a used boat. Finding one with more of a cruising focus rather than a fishing machine focus seems like it might be a challenge. One more rookie question: If I'm never going to want to move at 40 knots, is it stupid to choose much smaller outboards than a hull can accept? I get the re-sale and running to shelter concerns, but will running an outboard at low rpm's for long lengths of time muck it up? Thanks again, all. I really appreciate your help. if you want to keep to the slow lane in regards hull speed? AND you want to do work on the fit out and finish- why not consider exploring commercial fishing boats of welded aluminum? I think there'd be a few around that need some work? Buy one that is a decent hull, and strip her out and refit? Just a thought from the last post. Pilgrim, this post is about solar panels on welded boats, and using them North of the Puget Sound, general remarks. First mounting the panels is kind of a rodeo- UNLess the entire cabin roof/top were designed for the installation? By this I mean that panels' mounts are usually in the corners and involve different geometry to secure the panels. Often roof top panels, on buildings and homes use an angle to the sun based on the latitude of the installation- North of Puget Sound that gets a bit steep- not saying that it can't be done but a flat installation is not going to generate the same power an inclined panel will (?). I'm implying this will either reduce the output if the panel(s) are flat to the roof OR they will add an interesting angled look to the cabin top. In Florida or even Virginia, the angle may be flat to the cabin but I suspect they will need to be a bit more inclined further North? Last point on installing on the cabin top; lots of boats carry a raft or spare pots, buoys and line up there, so the panels will need to be planned pretty carefully for location and traffic. I did some design research several years ago to consider a design of a remote telemetry station which would have to rely on battery power to continue to data log and transmit collected data by RF. At that time, solar panels N of Seattle, roughly weren't very reliable source of continued power. They can be useful as intermittent (seasonally) power but we ended up learning from the telemetry packaging firms (world wide distribution) that even with inclined to sun installations they won't offer any assurance of performance North of the Canadian/US border latitude. This was years ago, and I'm confident the technology has improved, but I think there are lower cost alternatives that would deliver more reliable charging. Just a few more cents worth of opinion.